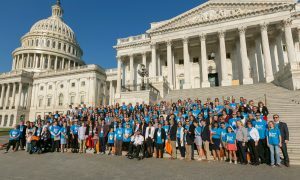 After years of advocacy, Congress finally passed the Childhood Cancer Survivorship Treatment Access and Research (STAR) Act. This is one of the most comprehensive childhood cancer bills ever introduced to Congress, and will advance pediatric cancer research and address the ongoing needs of survivors. Making Headway is so proud to have been part of the successful advocacy team and are grateful to all the families who made this possible. Just a few weeks ago, Making Headway Foundation sponsored families that we work with to be part of “Head to the Hill”, a day to advocate for brain tumor research and programs on Capitol Hill. Four Making Headway families, each impacted by a childhood brain tumor, told their story at the offices of Senators Chuck Schumer, Kirsten Gillibrand, Richard Blumenthal, and Chris Murphy, as well as eight members of the House of Representatives. Making Headway is so proud of these families, each who was able to connect with public officials in a way that even the best paid lobbyist could only dream of. https://makingheadway.org/wp-content/uploads/Head-to-the-Hill-Everyone.jpg 1682 2802 mhuser_admin http://makingheadway.org/wp-content/uploads/2017/04/MakingHeadwayLogo-2.png mhuser_admin2018-05-23 20:44:522018-05-23 20:44:52Congress Passes Childhood STAR Act.